Deformations let you animate bitmap or vector-based graphics, including gradients and textures. 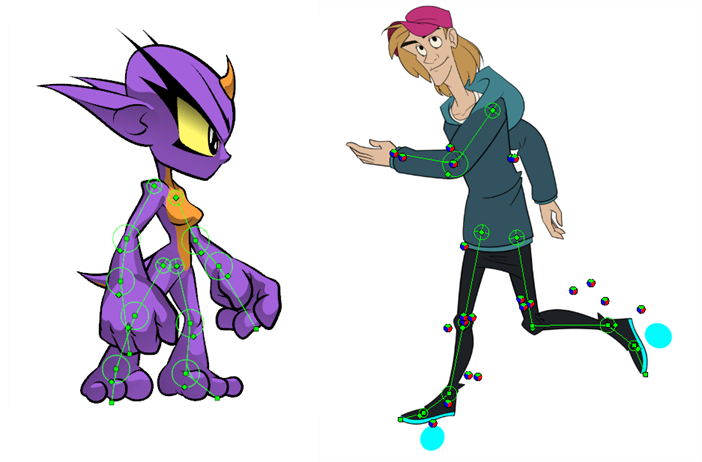 Deformations act as a skeleton with limbs and articulations you can bend, reshape, and curve. You can deform a character made out of one, or many, drawing or image layers and make it move as if it were a cut-out puppet. 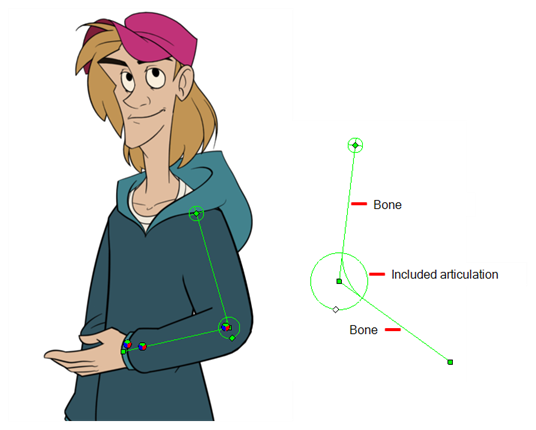 A deformation skeleton is composed of deformation nodes, which are the various pieces (here represented as layers or nodes) required to articulate or deform your drawings, such as a series of bones or game bones—see Deformation Nodes. These are the types of deformations. The Game Bone deformation is very similar to the Bone deformation and allows you to create a skeleton structure in which the parent bone moves the child bone. The difference is that the Game Bone deformation is optimized to export to game engines, mainly Unity. 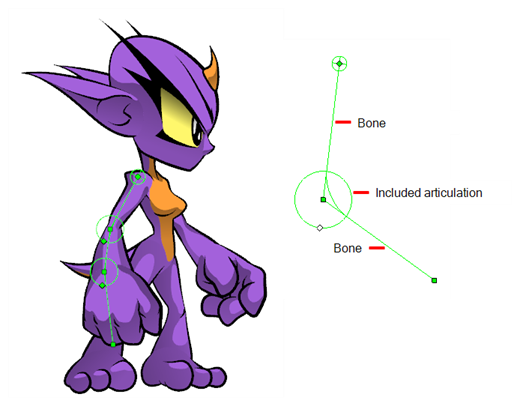 The Game Bone deformation is mostly used when animating the extremities of a character, such as the arms or legs, adding fluidity and a natural feel to the animation. The Game Bone deformation can be manipulated to rotate a limb at an articulation joint and to shorten or elongate the extremities of a limb. It's also quite useful for bending the torso. The main difference between the Bone and Game Bone deformations is that the Game Bone deformation doesn't have the Bias parameter. The rendered result is also different for the articulation folds. They are slightly rounded.